Since I already did the "big deal" running a full marathon last year, it kind of seems like a non-big-deal to write about a mere half-marathon, doesn't it? Not to me! On Monday, I ran 12.2 miles and wondered out loud how I had ever managed to run a full marathon only 6 months prior. Around Wednesday, I was browsing the Marine Marathon website, and saw that the half, only 4 days away was still available for registration, so I took the plunge. The cheapskate that I am, I couldn't bear the thought of spending the night in a hotel, so I went to a KOA campgrounds just south of Fredericksburg. I found the plot to be just big enough for my Ford Escape and my tent, and a small place to set my campfire. The facility provided firewood for me, and I tried to light up a nice campfire after I got back from a dinner at Noodles and Company. The fire never lights as easily as Bear Grylls does on Man vs. Wild. Despite soaking my firewood with lighter fluid and using paper towels as the lighting agent, I just couldn't get the fire to start. The KOA provides firewood, but doesn't provide any kindling, and I didn't pack my hatchet to chop the firewood into smaller pieces to get the fire started. After my second failure of lighting a campfire, I was getting killed by mosquitoes, and it started to rain. Off to the tent I went. It wasn't much later than 1930, but without anything to do, I turned in early and got to sleep during the ever increasingly powerful thunderstorm. My neighbors at the KOA were what appeared to be a newlywed couple with their dog, Toby, and a guy with his wife up from Blacksburg visiting the battlefields. I know the dog's name was Toby, because I heard his owners shout, "Toby! Stop barking!" about 8 times. Dogs hate me. I slept pretty well, sometimes waking up wondering if the waterproofing job on my tent was going to hold up or not. When the alarm went off at 0500, and then again at 0510 (I set two separate devices to wake me up), I spent about 20 minutes tearing the tent down and packing it up, in a light rain, in complete darkness. There turned out to be only a little bit of water at the bottom of the tent, which I think was from condensation, and not a leak. That's my story, and I'm sticking to it. I parked in the Walmart parking lot with about a third of the other race participants and walked to the event. I decided at the last moment that the rain jacket would not be necessary, and this was an excellent decision! I left it in the car with everything else, except for my belt, my bib and my Garmin. At the starting area, I looked for my DailyMile.com friends, but couldn't find any. At the starting line there was about 10 thousand porta potties, and I managed to find the cleanest one in the lot. It's a very important part of pre-race preparation, you see. I took my time, and was interrupted by somebody knocking on my porta-potty door. Maybe it was too much time. Glad I got that taken care of before the race! Everybody packed up to the front of the line as the race was about to start. Whatever feeling of chill I had before that point went away as everybody standing next to me radiated enough body heat to take the chill out of the air. I was rather worried that somebody was going to step on my toes, it was so crowded. There was no water to be found at the starting line, and I hadn't yet drunk any water that morning, so I started off thirsty. Drew Carey, the special guest at the event, made the leading announcement, and the gun went off at 06:59, first for the wheelchair participants, then again at 0700 for the rest of us. I get nervous before these races. I have a resting heart rate around 60, but standing at the starting line before the gun went off, I think my heart rate was around 130. Once I got started, I used my GPS watch's function of the "virtual partner" to keep me at a reasonable pace. (Watch the video to see what the virtual partner is) I was shooting for a 2:30 finish time, which would theoretically mean I could run a 5 hour marathon. By mile 2, I was nearly 3 minutes ahead of my virtual partner, meaning I was really hauling a lot faster than I should have been. I've recently been reading Barefoot Ken Bob Saxton's book about barefoot running. And although I was wearing my VFF Sprints for this run, there are a lot of techniques that apply. One such technique is running downhill, which I had not mastered. I used to think that since barefoot-style running could not heel strike, that barefooters were at a serious disadvantage going downhill. Not so! Just let go of the brakes, and let the hill take you downhill as fast as your legs can comfortably go. Each time that a downhill stretch approached, I would leave the pack that I was running with and fly down the hill without having to work at maintaining the speed at all. I heard one lady say to her runner friend, "ooh! that looks painful!" and I'm sure that if I was wearing thick-heeled shoes like she was, it probably would have been painful to do all that heel striking on the way down. Instead, I justed used the bouncy tendons in my feet to spring me down ever-so-smoothly. Neat! I was chugging along quite nicely ahead of my virtual partner. After mile 8, he started to gain on me. I gave up my 2 minute lead, which turned into a 1 minute lead, which looked like a 22 second lead as I walked into a water station. I tanked up with Gatorade and water, and headed back out, and found myself 48 seconds behind my virtual partner. I tried to catch up, and managed to catch up after a few minutes, but could no longer maintain the pace, and watched my virtual partner fade off into the distance. After mile 9, there were no more downhill sections for me to let go of the brakes, and it was all uphill from there. Between miles 10 and 11 is a 100 foot climb called "Hospital Hill". It's not named that because running up this hill will send you to the hospital, but simply because that's where the hospital is. I really didn't have a lot of energy left at this part of the run, so I certainly walked a few parts of hospital hill. I did refuse to walk up the entire hill, though, and managed to run out a significant part of it. By the last mile, the top of my right foot had started to wear on my shoe, and I had a patch of skin get rubbed through. I actually bled enough to make the blood stain through the top of my shoe. Remember, I don't wear socks with VFFs, so it's not as bad as you can imagine. I thought about taking off the VFFs and running barefoot to the finish line, but decided that stopping might mean extreme difficulty in getting back up again. The crowds cheering along the way were really fantastic, but I can see that people cheering probably didn't cheer as much as the people a half-hour in front of us. There were a lot of people walking at this part of the race, but I refused to spend any more time walking, and ran as much as possible. I crossed the finish line and had this spaced-out look for a while, as I was given my medal, a bagel, a bottle of water, and some sort of Gatorade pouch with lots of sugary gel inside that I didn't get around to drinking. 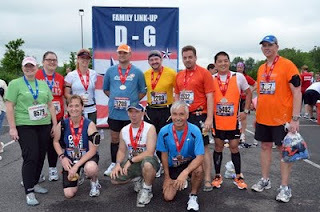 I met up with my DailyMile.com friends at our designated meeting point, and got in for a group photo. After meeting up with the DM friends, I moseyed over to the beer tent, and got my beer -- Especially delicious after the lost opportunity at the beer tent that I didn't get from the full marathon last October. Hey 2100 calories on a morning run. Not bad!